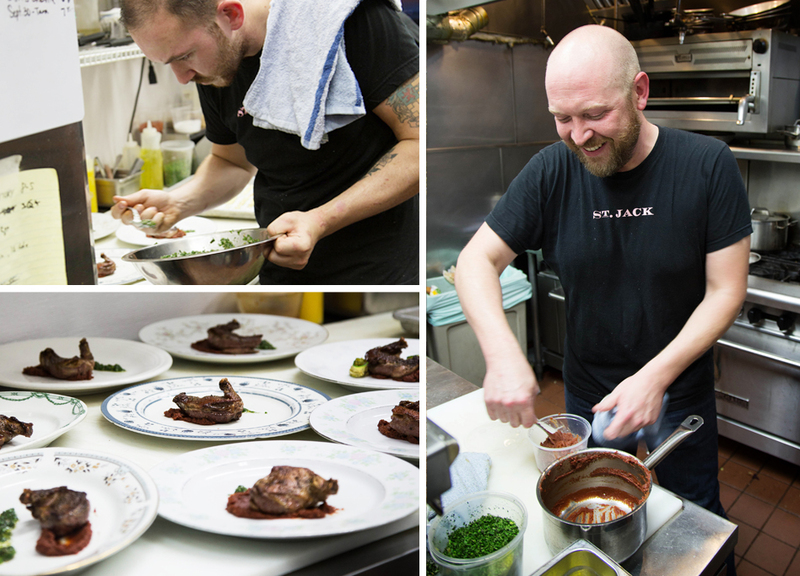 This month’s Portland Food Adventures brought us to esteemed French restaurant St. Jack, tucked away in Southeast on Clinton St. This particular PFA was a very special fusion of the amazing Chef Aaron Barnett, previewing the event Wild About Game run by Nicky USA, and featuring exclusively Helioterra Wines. 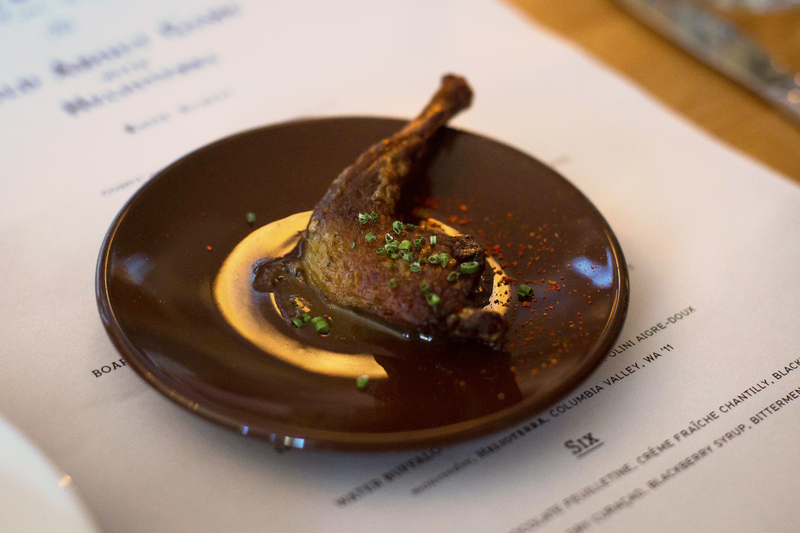 As everyone settled in we started off with a confit squab leg. 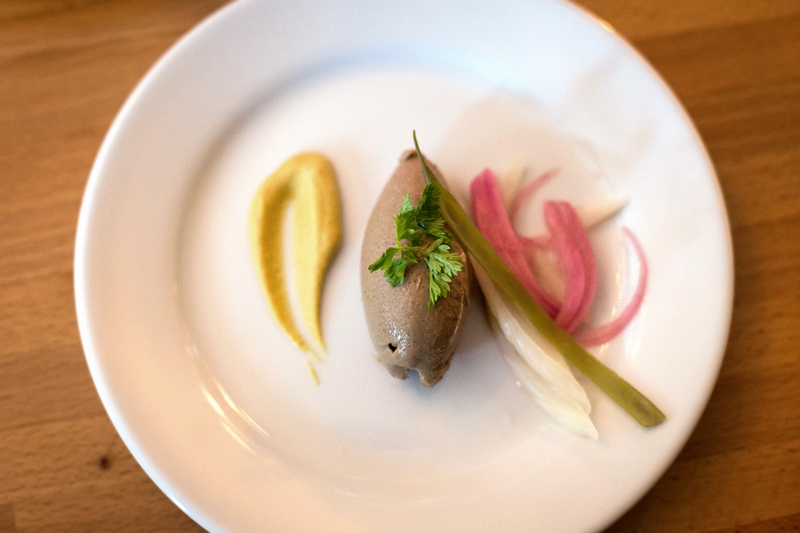 We were quickly brought our first course, a rabbit liver mousse with a few ‘pickled things’ accompanying, paired with our first Helioterra wine, melon du bourgogne. The flavors in this were fantastic, super rich and dense. Chef Aaron Barnett (below, left) came out to talk to us a bit, keeping things short and sweet as he had much work to do in the kitchen. We also had Geoff and Melody Latham of Nicky USA there with us to talk a bit about what they do and their upcoming event, Wild About Game. 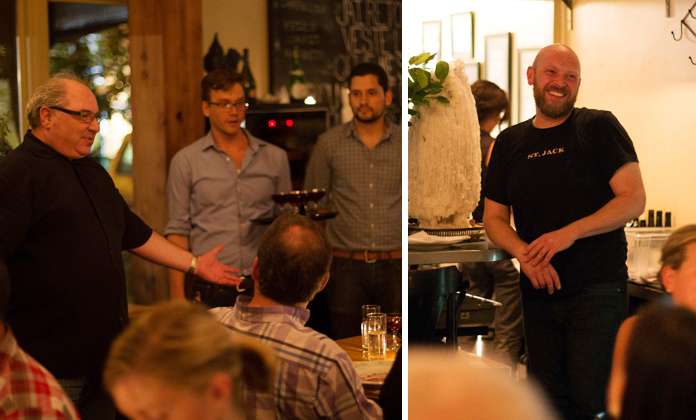 Geoff talked with us a bit, and it was so obvious the passion he has in his business. 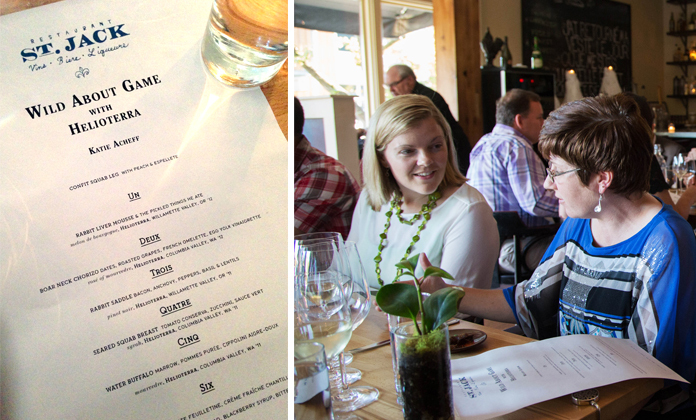 Geoff was very adamant about Nicky USA creating a fully local-to-table, sustainable experience that offers exceptionally produced game birds and animals. 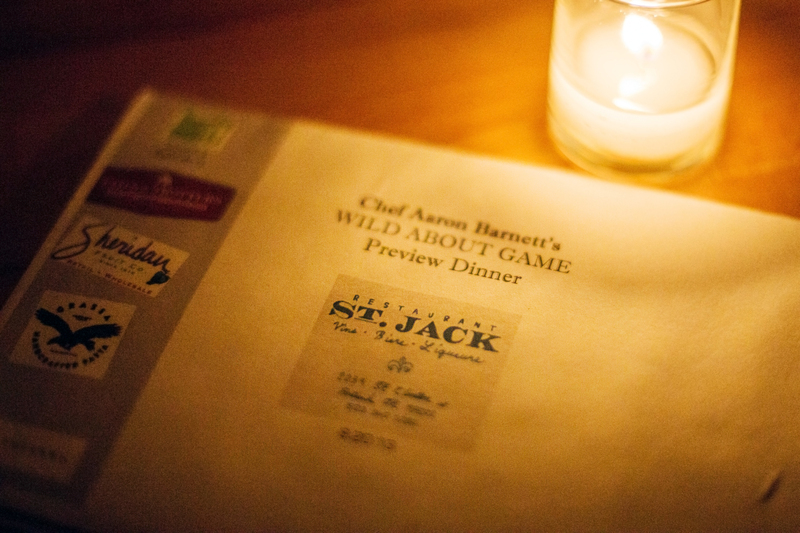 With the mixture of these fantastic meats and Chef Barnett, the dishes allowed for a perfect preview of Wild About Game that also represented St. Jack’s style. This also gave the chefs an opportunity to make some more unique dishes that you wouldn’t find on the traditional St. Jack menu. 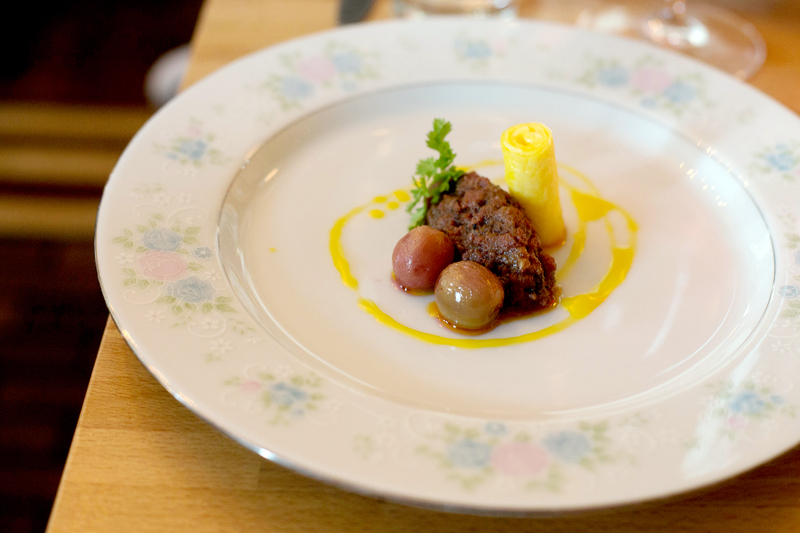 Next up was a more Spanish influenced dish, boar neck chorizo dates, with roasted grapes, French omelet and egg yolk vinaigrette. 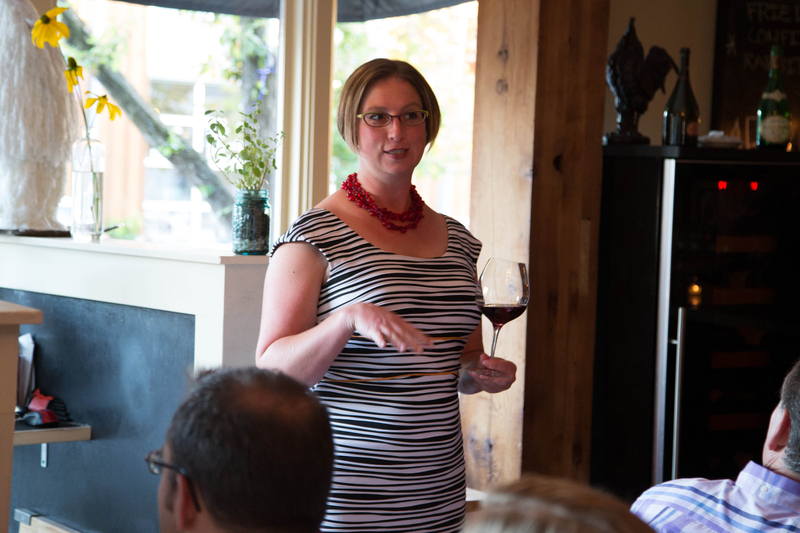 Anne from Helioterra also spoke with us for a bit, who works closely with manager Joel Gunderson to provide Helioterra wines. 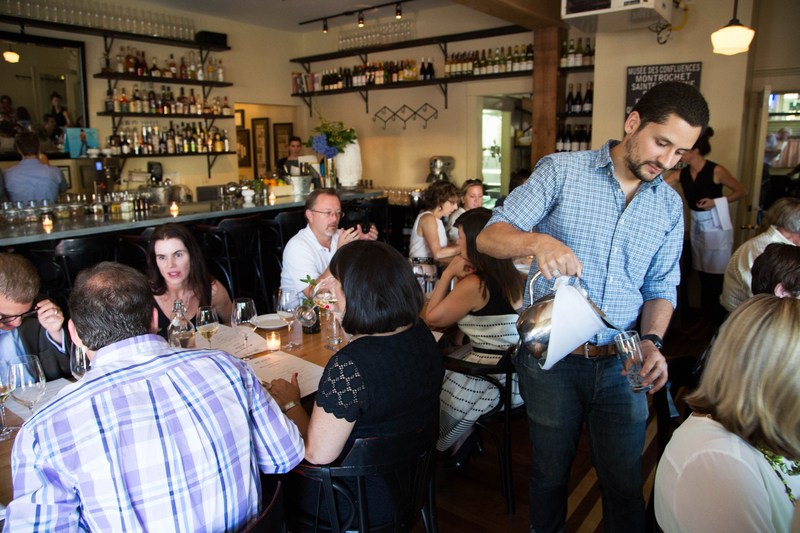 Part of their process is to provide wines barrel-to-bar, eliminating huge amounts of glass waste within the restaurant. 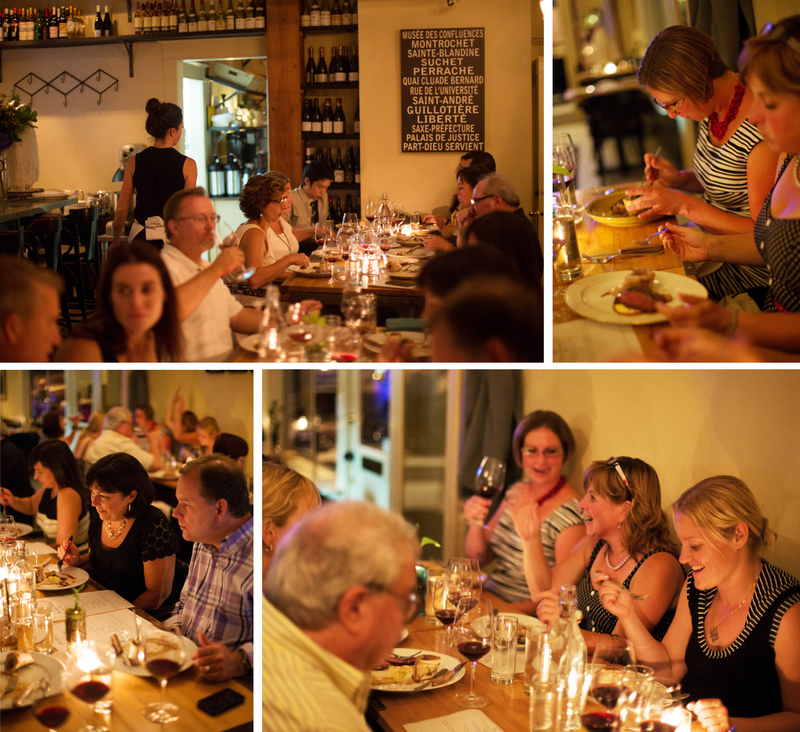 They strive to produce wine that goes instinctually well with food. Thanks to my tablemates for a nice “cheers”! 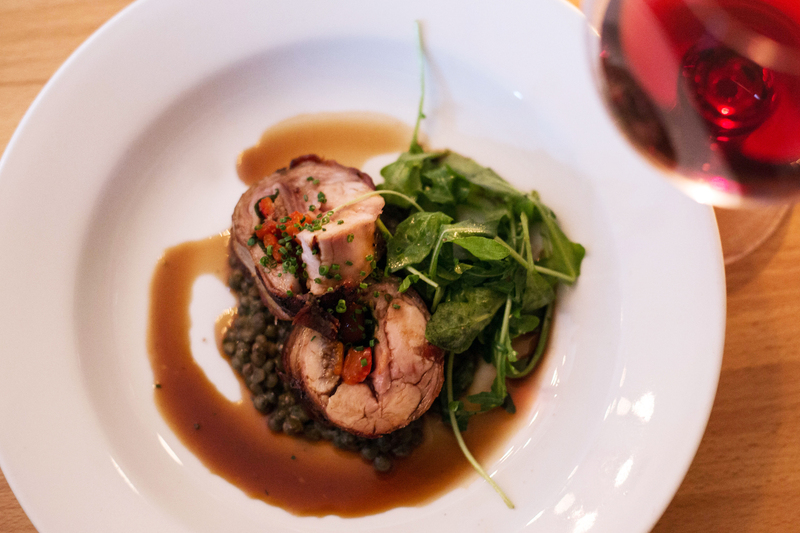 Next up was rabbit saddle bacon and anchovy with peppers, basils and lentils, paired with Helioterra’s Willamette Valley pinot noir. This is the time of night where I sneak into the kitchen and check out the process, here I got to see Chef Barnett and the rest of the team in action. I always love seeing the behind the scenes process, in this instance the kitchen staff was working quickly and accurately, while still jamming out to some sweet 90’s rap. 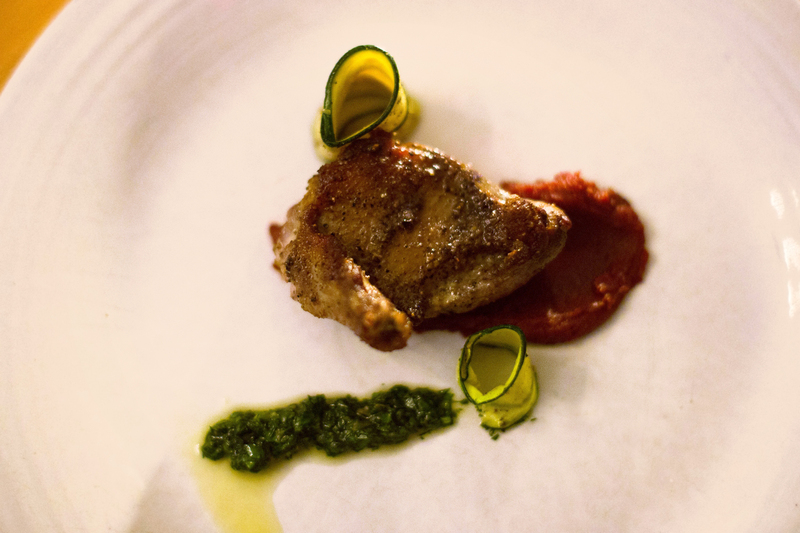 And below, all plated up was course four, seared squab breast, tomato conserva, zucchini, and a sauce vert. 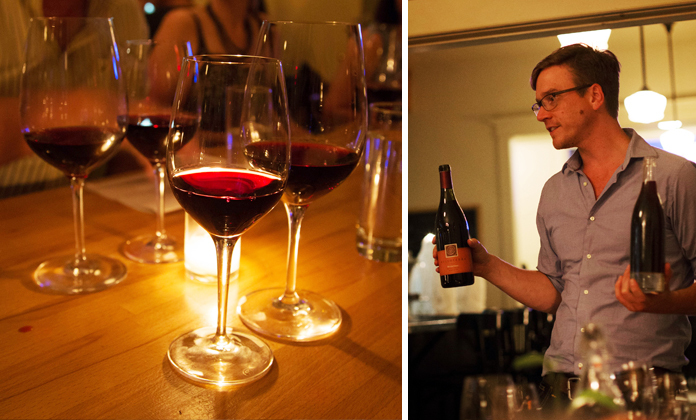 For our fifth course manager Joel Gunderson (below, right) offered us an interesting take on the same wine, Helioterra’s Columbia Valley mourvedre, in both a bottled taste and straight from the barrel. I enjoyed both of them thoroughly, also I might not have a sophisticated enough palette to completely get the differences. Next up was a really amazing course, water buffalo bone marrow, with pommes puree and a cippolini onion aigre-doux. 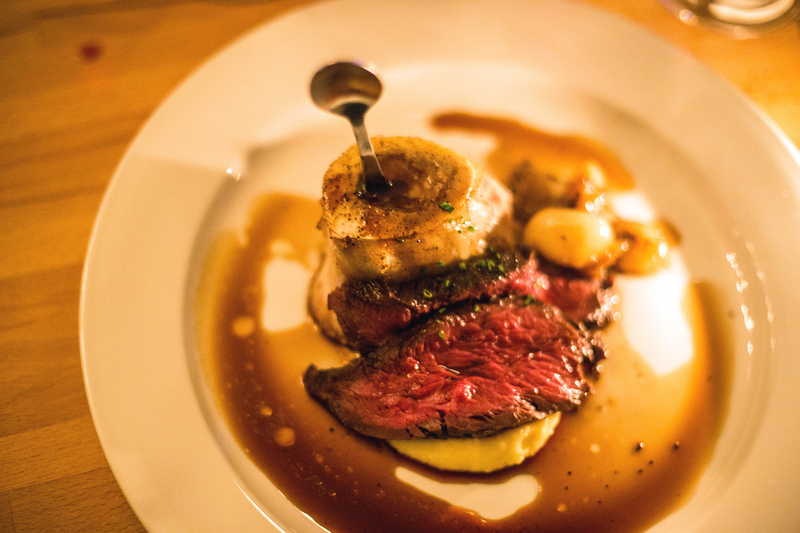 There is such richness of the meat and marrow, with a great balance of the pommes puree and deep red wine. This is my second bone marrow experience and while I still need to adjust to the texture, the flavors were delicious. 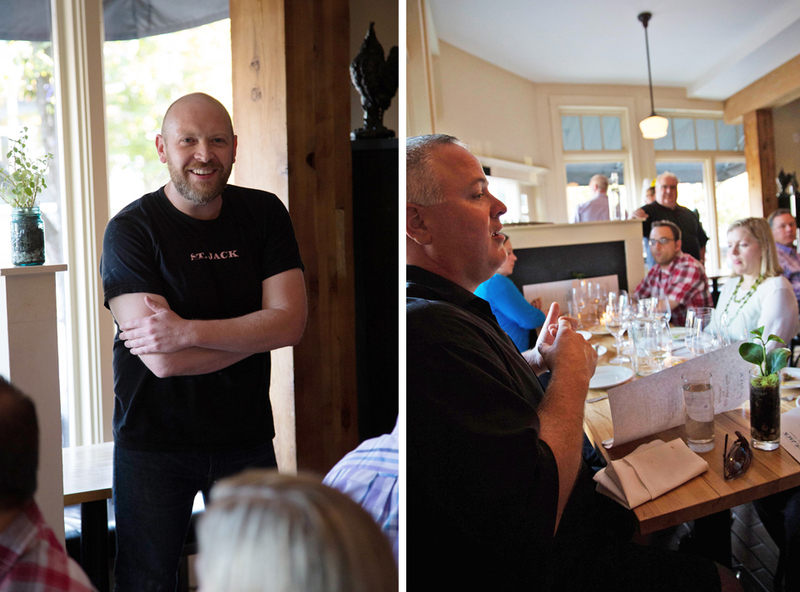 Of course Portland Food Adventures are a great social experience, with lots of wine and great conversation, I love the opportunity to meet other foodies and talk to chefs or members of the food community, like Geoff and Melody from Nicky Farms. Chef Barnett was nice enough to come out and talk with us all a bit, as we were served our final course, a beautiful blackberry mousse cake, paired with a Blackberry Bishop, a wine based cocktail made with blackberry reduction, to complement the dessert. As the night wrapped up our host, Chris Angelus, and the staff of St. Jack all came out to some much deserved applause and told us a bit about our gift certificates to keep the adventure continuing. This session included Sheridan Fruit Company, Grassa, and Tails and Trotters. And that’s it for now! 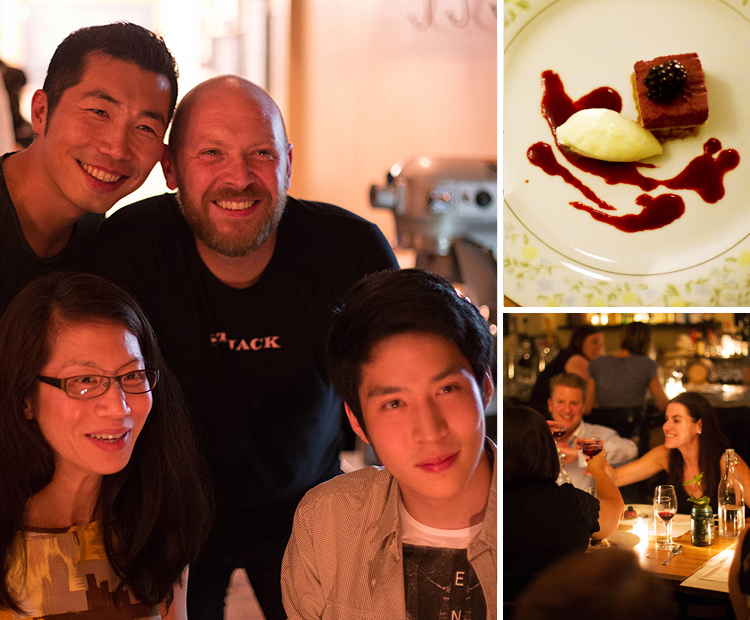 Thanks to all the staff of St. Jack, Nicky USA and Helioterra wines for creating a truly unique dining experience. It’s not often to get so many of this high caliber on board for collaboration, and they executed it perfectly. Check out Nicky USA's Wild About Game event coming up on September 8th. 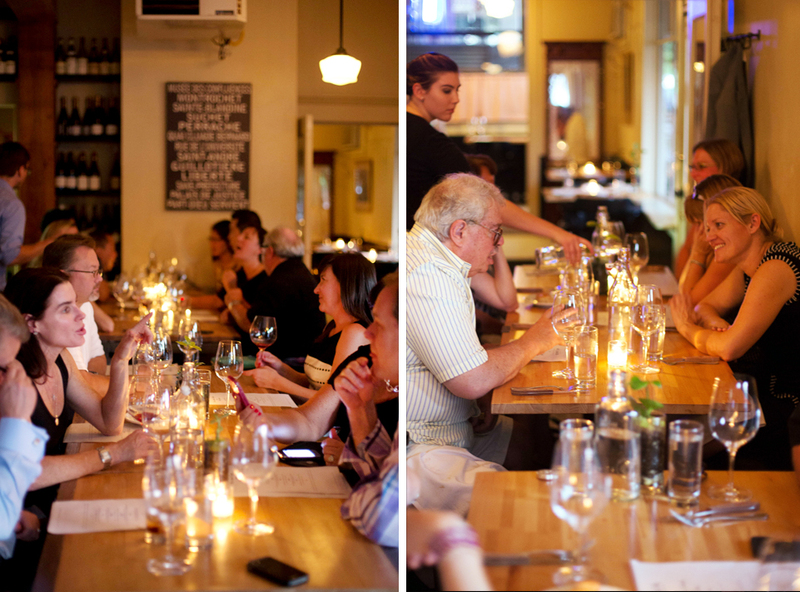 And soon to come Portland Food Adventures at Paley’s Place! More to come soon. Cheers!